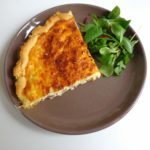 Hi Meg, I made the Quiche aux Asperges et Pleurotes and followed your recipe as carefully as possible. The crust didn’t brown. Was I supposed to bake it first before adding the veggies and cream/egg mixture? It looks so beautiful but the crust is just a soggy mess. I am determined to make this!! Thanks for any advice.